This introductory voyage through the Major Arcana reaches Justice which according to the esoteric system of the Golden Dawn is associated with the sign of Libra. Justice is the Major Arcana associated with the sign of Libra. In many tarot decks, and in the Rider Waite Tarot, to which we specifically refer in this article, this card portrays a crowned woman, or androgynous figure, resolutely sitting on a stone seat, with one foot protruding from her robe. The woman holds a pair of scales in her left hand and pointing up with a two-edged sword in her right hand. The image reminds the Greek Titan goddess Themis, daughter of Uranus and Gaia (Heaven and Earth), mother of the Seasons and of Astraea (“star-maiden”), the last of the immortals to live with humans during the Iron Age. Themis is traditionally featured as a symbol of justice in court houses and tribunals. Yet, unlike these social representations the Justice of this trump is not blindfolded. This card is about consciously seeing and acknowledging the truth about ourselves and the world, and making the right choices according to a deep inner sense of justice rather than to what is considered just in the consensus reality. A deep sense of justice acknowledges all aspects of reality, ordinary and non-ordinary, life and death, keeping them in balance, without either of them prevailing. The two-edged sword held in the right hand emphasizes the power of the conscious exercise of choice. Each choice we make allows us to move on through the healing path. This path is formed by all the choices we have made in the past, which determine our future according to the choices we make in the present. Justice may confront us with the beginning of a new cycle in which a choice is required. 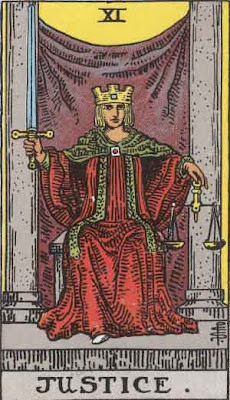 This is not a very popular card since it is devoid of the glamour of most trumps and also because it challenges us with all the fears related with justice, punishment, judgments, etc. In the Aleister Crowley’s deck the card is called “Adjustment” suggesting a modification, amendment or balance of one’s own path, as a result of the acknowledgment of something wider with the wider. Justice, which in traditional Christianity is the most important of the four Cardinal virtues, represents the moderation point between selfishness and selflessness, and plays a pivotal role in adjusting all possibilities of relationship. Justice is assigned to Libra, the seventh sign of the zodiac. The first six signs of the zodiac, Aries through Virgo, are related with the development of the ego and the individual self. Their nature is subjective and focused on the relationship with oneself, in which rapports with the outer world are oriented and understood solely according to one’s individual intention. Libra and the Autumn Equinox mark a major shift and the inauguration of the cycle involving the second six signs of the zodiac. These signs are focused on the integration with the outer world, and more esoterically with one’s shadow, the non-ordinary, included death, with the aim of expanding the edges of the individual conscious self. Libra is the initiator of this second half and moves the first step towards the other, which usually entails the most basic form of human interaction, i.e. partnership or marriage, which at an esoteric level correspond to a first step into initiatory death. The major challenge here for Libra is keeping the balance between the individual self-focused self and the social couple-oriented self, inner and outer world, conscious and unconscious, life and death, ego and shadow. 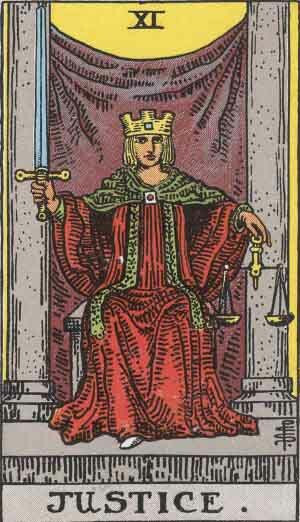 Justice can represent a stern moment of awareness in the above respect, a firm warning on balance in our relationships and all aspects of life and, especially, of death. Death is indeed the aspect that goes most out of balance, since in our consensus reality represents the major denial and unconsciousness. As a result, Justice often confronts us with the fear of death, which also includes the incapacity to let go in our relationships with others and the world, the failure to accept the provisional state of physical reality and the rejection of what each human being is bound to face at the end of their journey on this planet. It is essential to point out here that a true balance between polarities and worlds can only be pursued through the direct participation of Spirit, the third polarity, the Core Multidimensional Identity (CMI). Hence the figure in the card points the sword up with the right hand, stressing the need to direct one’s conscious attention to the presence of Spirit, as the essential requirement for maintaining balance. Justice, and Libra, also operate as gateways to Death and Scorpio, the following trump and sign on the voyage through the zodiac. The card represents all the mediating figures that guard the access to the other world and to any major process of transformation, such as death, rebirth, shape-shifting, etc. The model of Maat, the Egyptian goddess of truth and justice, is specifically exemplified here. It was Maat that at the time of death weighed the heart of the deceased in the Great Balance against her ostrich feather. If the heart was found to be heavier than the feather, the soul was sent back to the third-dimensional realm, the world of illusion and separation, so as to release the extra weight, while when the heart was lighter, or of equal weight, the deceased could move to the next realm. This was inherited by the Christian tradition, where the archangel Michael also holds in his hands the scale of justice and weighs the souls of the deceased. Justice describes the essence of all ancient mystery schools and esoteric knowledge. It is associated with the truth and justice that is unchanging, being the same in the beginning of time, in the present and in the future. It includes any act or state that promotes balance, co-operation and reciprocity between all apparent polarities and diversities, between higher and lower realms, life and death, gods and human beings. Justice is the acknowledgement and conscious expression of multi-dimensional balance and harmony. In ancient times there was no separation among dimensions. All the realms were united and men were gods, and gods were men. When the process of separation began to take over, ritual practices were introduced in order to safeguard the connection, at least in certain moments of the day or in specific places (temples, sacred sites, etc.). Hence, the celebration of rites and spiritual exercises, the use of particular traditions and customs became a way to practice Justice. These would, and still, allow a relationship with the ancient gateway or bridge to other dimensions, although they did, and do, not necessarily imply the passing beyond. While the allegiance to specific practices is fundamental and demonstrate one’s will to retrieve the original unity, in order to truly move beyond we ultimately need to cross the familiar structure of the bridge and step into the mystery, the sphere of gnosis, i.e. knowledge gained through direct experience. In tarot readings Justice indicates a moment in which vigilant awareness is required in order to gain wider awareness regarding what is happening in one’s life It may indicate that a certain outcome or situation is the consequence of decisions made in the past, and that needs to be karmically accepted, no matter whether it is good or bad. At the same time this can promote the possibility of changing or correcting a course of action in consideration of the lessons learned from the past and present. It can also signify a potential outcome in the above terms for the future. Moreover it can represent a confrontation with what was disregarded or denied, because uncomfortable, such as a completion, death, or any situation of release, which now emerges and call for rebalancing.